Big Bear Lake and the surrounding area is a little piece of mountain heaven. It is easily accessible from major Southern California cities, has plenty of seasonal activities and visitors can enjoy free access to the lake. If you own or are thinking of purchasing a cabin in Big Bear and turning it into a rental property, there are a few things you need to consider. 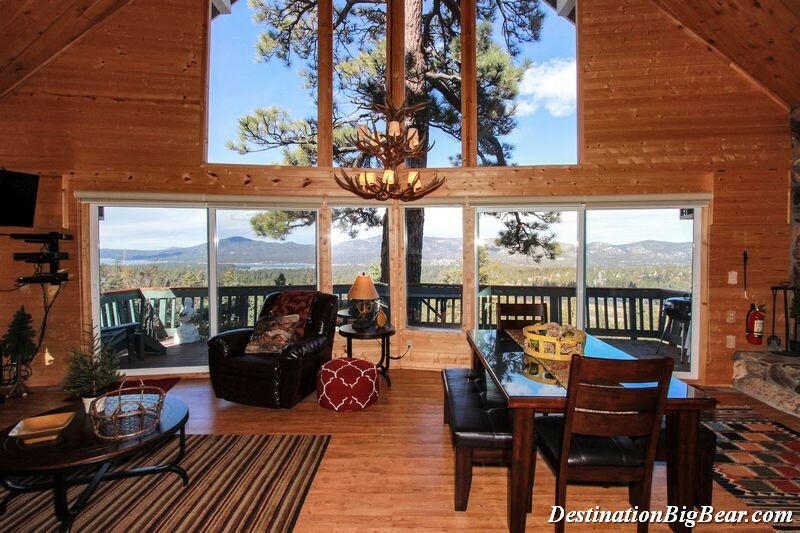 Destination Big Bear is here to answer all your questions and give you peace of mind about turning your second home into an income property. This homeowner checklist will help you decide and help you plan turning your home into a cabin rental in Big Bear. Vacation homes are privately owned homes that are rented out on a short-term basis to visitors who desire larger spaces, privacy and the comforts of home. The property has the potential to make the homeowner additional income while not in use. We understand it can be a big decision, and we encourage you to discuss the options regarding location, wear and tear and costs with our experienced and knowledgeable staff. If HARD WIRED: Smoke Detector AND CO2 must be combined in one (same) unit. Bear Valley Fire will bill Destination Big Bear and you will see a charge on your statement. Note: Currently, we have a company that does the fire safety items – it is cheaper for them to do it most often, than for you to do it yourself. Destination Big Bear can coordinate this. One (1) 2A:1OB:C type refillable fire extinguisher per level with current inspection certificate is required. Fire extinguishers shall be mounted in visible locations with the tops of the extinguishers mounted between three (3′) feet and five (5′) feet above the floor and shall be accessible to occupants at all times. Yearly service is required. A minumum of one (1) smoke detector is required per level; in the kitchen, in each sleeping room and in hall way between bedrooms and must be located within twelve inches of the ceiling’s peak. One (1) carbon monoxide detector is required per level. Emergency lights must be provided so that there is a reasonable level of illumination to light exit routes. No gaps of four inches or more between railings on any decks for child safety. No tree branches within ten inches of chimney. All sleeping areas must have screens on the windows without any holes. Furnishings cannot block window egress. Wood burning fireplaces must be equipped with screens and 5 gallon metal ash can. On a gas log fireplace, the damper must be permanently fixed in the open position. Charcoal BBQ’s must have a lid, metal ash can and wire brush. No permanent use of extension cords with lighting, heaters, appliances, etc. Hot tubs and spas must have 2 clips on 2 sides of an approved cover. A combo lock is also recommended to keep neighbors out. A rail extension is required as well if hot tub has less than 36” clearance to railing and if deck is 3 feet or more above ground. No exposed wiring or overloaded electrical circuits. Switch plates on all outlets. No horizontal slats on decks that are higher than 3 feet. Ask office for details on what to do. Spark arrestors must but on all fireplace flues. Any locking mechanism on outside doors must be operable from inside the unit without the use of a key. Any locking mechanism must be located no higher than four feet above the ground. Property address, exterior light and exterior sign must all be plainly visible from the street. There must be at least a 54″ minimum clearance between furniture/combustible material and the fireplace opening and a 30″ clearance between combustibles and wall heaters. No leaking fixtures or clogged wastelines. All appliances must be operational and water heater tanks must be secured with earthquake straps on top and bottom thirds of tank. Garbage disposal must have a stress (romex) clamp installed. Snow removal must be provided. Keep in mind, that the City Ordinance is always adding more things to the list for safely. They may come out 1 year and find several items that need to be taken care of and then the next year, discover other issues that they did not see the year before. If you ever have questions about code items, please contact the city at 909-866-5831. 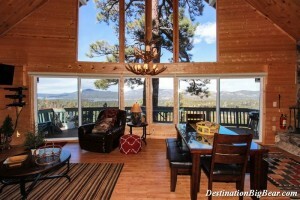 Destination Big Bear does not make a profit on any items that need fixing for city code. We simply fix whatever the city instructs us to do in order to get your home rented in a timely manner. We do have the resources to have code items fixed and you are always welcome to hire your own contractors if you prefer. Your home will not be able to rent out until those issues are fixed and your home passes inspection. All issues/changes must be addressed and updated in order to pass re-inspection and any bookings. The max occupancy of transient private home rental shall be one (1) person per two-hundred (200) square feet of building area, excluding garages or other accessory buildings. The occupancy of transient private home rental unit may never exceed sixteen (16) people, regardless of property size. Identify closets or storage areas that can be locked and store any personal items that you highly value or would not want a stranger using. Store or remove any items you do not want stolen or damaged. Destination Big Bear provides linens and towels. Store or remove your personal bed sheets and towels to prevent loss or replacement by cleaning staff. Windows should be lockable and in working condition with screens that are in good repair and no holes (City Code). Window coverings such as mini-blinds and curtains for security and privacy and should be in working order. Vacuum with bags and extra belt for guest use. Destination Big Bear housekeeping provides their own vacuum for cleaning. Washer and Dryer recommended if longer rental stays are desired. Snow poles for free city snow plowing of berms. Can be purchased for $15 each. Barbeque grill. Propane is recommended. No table top grills. Wire brush, utensils and ash can (if charcoal). Portable heater for cold months and fan for warm weather. Snow shovel for tenant use. Flashlight- at least 2 with batteries. Pots, pans, lids, strainer, cooking utensils, cutting knives, cutting board, mixing bowls, bake ware such as casserole dish and baking sheet. 409 or other general purpose spray cleaner and glass cleaner. Dishwashing soap, sponges and dishwasher detergent are provided by Destination Big Bear but it is recommended for owner to provide if prefer a specific brand. If trash compactor is available, homeowner should supply compactor bags. Destination Big Bear provides dish towels, paper towels, trash bags and sponges. Table with chairs for occupancy with glass or plastic cover to protect surface. Each bed and pull-out couch should have 2 blankets, 2 pillows and bedspreads/quilts. NO KING PILLOWS – only standard size pillows. Destination Big Bear provides sheets and pillowcases. Extra blankets in closet for colder weather. TVs are recommended for all bedrooms with remote controls. Cable and DVD player optional but preferred for bedrooms. Recommend minimum of 12 hangers per closet. Bath mats. Should be easily washable and non-slip. Color TV with cable, DVD player and remote controls. Flat screen preferred. Area for firewood storage, metal ash can with locking lid, fireplace tools and lighter. Non-flammable hearth rug to protect floors from burns. Pool table, foosball table or gaming table. Flat screen TV’s. Preferred in all bedrooms with cable access or DVD player. Hot tub. Small size is O.K. for easier upkeep and cost. Locking cover for safety. Pleasing, updated décor with a cohesive theme. Recliners and pull-out couches due to mechanism failure and wear and tear. Light colored carpet. Dark carpet is best to hide stains. Solid surface is desired.